Paul Cézanne (1839-1906), The Card Players, c.1890-92. Oil on canvas, 65.4 x 81.9 cm. The Metropolitan Museum of Art, New York, Bequest of Stephen C. Clark, 1960. LONDON.- Paul Cézannes famous paintings of peasant card players and pipe smokers have long been considered to be among his most iconic and powerful works. This landmark exhibition, organised by The Courtauld Gallery in London and The Metropolitan Museum of Art in New York, is the first to focus on this group of masterpieces. Described by Cézannes early biographer, Gustav Coquiot, as being equal to the most beautiful works of art in the world, this is a unique opportunity to enjoy these remarkable paintings in unprecedented depth. The exhibition brings together the most comprehensive group of these works ever staged, including three of the Card Players paintings, five of the most outstanding peasant portraits and the majority of the exquisite preparatory drawings, watercolours and oil studies. Cézannes Card Players stand alongside his Bathers series as the most ambitious and complex figurative works of his career. The first mention of the Card Players series comes in 1891 when the writer Paul Alexis visited Cézannes studio in Aix-en-Provence and found the artist painting a local peasant from the farm on his estate, the Jas de Bouffan. A number of different farm workers came to sit for him over the years, often smoking their clay pipes. They included an old gardener known as le père Alexandre and Paulin Paulet, who posed as the figure seated on the left in The Card Players, a task for which he was paid five francs. Cézannes depictions of card players would prove to be one of his most ambitious projects and occupied him for several years. It resulted in five closely related canvases of different sizes showing men seated at a rustic table playing cards, including versions from The Courtauld Gallery, The Metropolitan Museum of Art and the Musée dOrsay. Alongside these he produced a larger number of paintings of the individual farm workers who appear in the Card Players compositions, major examples of which will be reunited from the Kimbell Art Museum, Fort Worth, the State Hermitage Museum, St Petersburg, the Pushkin Museum, Moscow, together with The Courtaulds Man with a Pipe. The monumentality of the works epitomises Cézannes stated aim to produce something solid and durable, like the art of the museums. 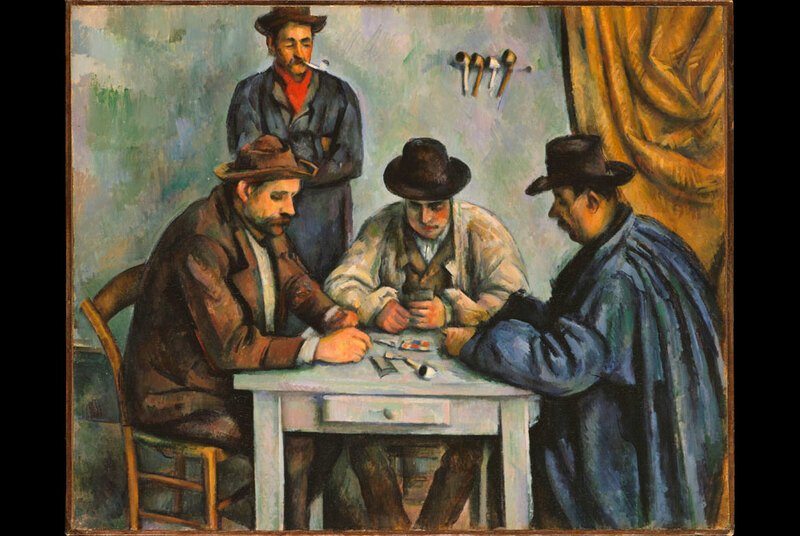 Appropriately, one of the first works by Cézanne to enter a museum collection was The Card Players, which was accepted by the Louvre in 1911, five years after the artists death. Perhaps the most remarkable aspect of Cézannes card player and peasant works is that their evocation of unchanging traditions was achieved by pushing the boundaries of painting in radical new directions. Cézanne painted freely and inventively, rendering his peasants through a vibrant patchwork of brushstrokes which animates the surface of the paintings. For most nineteenth-century viewers his technique would have appeared as coarse as his peasant subject matter but the Card Players would prove an inspiration to later generations of avant-garde artists. For Pablo Picasso, Cézannes peasants were a touchstone for his Cubist portraits and their example resonates throughout the twentieth century with particular homages paid to them by artists as diverse as Fernand Léger and Jeff Wall. The Courtauld Gallerys world-renowned Cézanne collection includes two of the masterpieces from this series, The Card Players and Man with a Pipe. These will be joined by major loans from international collections, including the Metropolitan Museum of Art, which will be the second venue for the exhibition from 9 February to 8 May 2011. Cézannes creation of a relatively large number of preparatory works for the Card Players paintings was highly unusual and indicates his commitment to this ambitious series. In preparation for the exhibition, The Courtauld and the Metropolitan collaborated on the first technical research project to look systematically at this group of works. This has shed fresh light on Cézannes working practice. Most importantly, by examining the extent of underdrawing on each canvas it has challenged established views about the sequence in which he produced the paintings. Whereas it has traditionally been assumed that he worked from the largest paintings to the smallest, gradually simplifying the scenes, it now seems clear that he started the series with the smaller canvases, using them to establish his iconic compositions. Cézannes Card Players is the latest in a successful series of focused exhibitions organised by The Courtauld Gallery, in which masterpieces from its own collection are re-examined in the context of important closely related loans from international museums and galleries. The show is accompanied by a fully illustrated catalogue, including contributions from leading Cézanne scholars, John House (The Courtauld Institute of Art) and Richard Shiff (University of Texas at Austin).